This is cross-posted from the Community Power Network blog. Read the whole article here. Two weeks ago the Distributed Wind Energy Association (DWEA) hosted their 2014 Distributed Wind Annual Lobby Day and Conference. Emily Stiever from Community Power Network attended and pulled together some notes and updates on new developments in the distributed wind space. 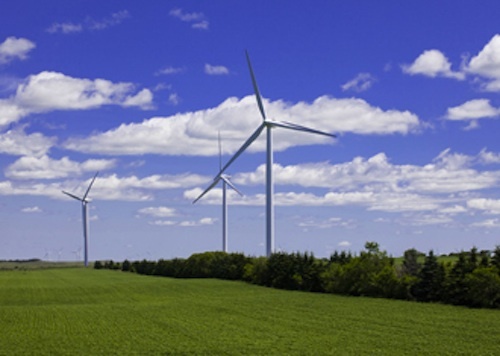 If you’re working on distributed wind energy issues, we’d love to hear from you. One of our goals is to build out the wind resource section of our website and highlight the work of distributed wind organizations around the country. Heather Rhoads-Weaver from eFormative Options LLC presented on policy drivers in the US wind market. There are currently about 812 MW of distributed wind installed in the US, with more than 69,000 individual projects. The top states for installed distributed wind capacity are Colorado, Kansas, Alaska, and Massachusetts. The Distributed Wind Policy Tool is a great way to see how various state-level policies impact project economics. Check out the tool here. Check out the 2012 Market Report on Wind Technologies in Distributed applications for more details on the state of the US distributed wind market. Tal Mamo, President of United Wind, discussed their newly developed wind leasing program. The large upfront cost of projects is a significant barrier to many people, particularly small farmers that would otherwise benefit immensely from in developing small wind projects on their land (because wind is a drought resistant cash crop!). Even if famers have the upfront capitol, many can’t take advantage of the 30% federal tax credit because they don’t have enough of a tax liability. Farmers are eligible for large write offs and many put any unused income towards purchasing assets (like a new tractor) at the end of year to avoid paying taxes. By offering a wind lease, farmers and other small businesses are able to develop a wind project with zero money down AND take advantage of all tax savings. United Wind is also offering a partial prepay, or full prepay option, which further maximizes returns. In the last six months, United Wind has committed $25 million in the first ever tax equity fund for distributed wind. This fund will be used to finance individual projects. They currently have $5.2 million in projects under contract and interest in wind leases has taken off. Wind leasing is a huge development for the distributed wind market because it addresses some of the key barriers to developing projects. Ian Baring-Gould with the National Renewable Energy Laboratory (NREL) talked about the deployment of wind-diesel systems for rural applications. Wind hybrid systems combine wind turbines with other energy generation or storage technologies, providing consistent power production even when the wind isn’t blowing. Many isolated rural villages, especially those in Alaska, get electricity from local diesel power plants that bring in fuel and supplies by airplane. Fuel delivery is extremely expensive and poses environmental risks. Energy prices in some villages are $1.00/kWh (10xs the US average). Check out this report on wind-diesel applications in Alaska. Communities are exploring wind-diesel hybrid systems as a means to reduce reliance on diesel fuel and costs, particularly in the face of oil price spikes. There are currently challenges to scaling up wind-diesel projects, since each system requires custom engineering, there is no streamlined method for financing projects, and there is limited funding for project follow-up and evaluation. There are limited steps that could be taken to improve adoption of systems, but there is currently no clear path forward for scaling up the wind-diesel market. Rusty Haynes with the law firm of Keyes, Fox & Wiedman discussed rebate and RPS policy changes that impact the distributed wind market. 29 states and the District of Columbia currently have Renewable Portfolio Standards. Of those, 17 and DC have a solar or distributed generation carve outs. 2013 and 2014 have been characterized by a number of attacks on RPSs, although the general trend has been towards “good” legislation that strengthens state RPSs. Check out the Powerpoint for an overview of state net metering and interconnection policies and see the types of regulatory changes that have happened in key states around the country. Hannah Masterjohn with Vote Solar presented on the concept of shared solar and how it can open up access to a large portion of Americans who can’t install solar on their own homes. Currently only about 20% of residents and businesses are able to install solar on their own property. Shared solar allows individuals or businesses to receive the benefits of a solar system installed elsewhere in their community. Shared solar opens up access to solar and makes it much easier for an individual to benefit from solar. It also creates opportunities for crowdfunding and other creative project financing approaches. Check out the powerpoint for a great map of states that have already adopted shared solar legislation. IREC’s Model Program Rules serve as a starting point for stakeholders looking to launch programs. The website includes draft legislative language and explanations of best practices. SharedRenewables.org is a central info source on shared renewables policies and projects across the U.S.
Libby DeLucia with the Clinton Climate Initiative discussed how their organization provides technical support to Caribbean nations looking to develop distributed wind projects. Currently the region is highly reliant on expensive diesel-fired generation for power. Electricity prices are around $0.35 to $0.45/kWh. Utilities such as Jamaica Public Service (JPS) have begun developing distributed wind systems and have been able to profit from these types of systems. JPS has also begun providing some financing for projects and is considering a third-party finance model that has the potential to encourage expansion on other islands. There are a number of opportunities for distributed wind to expand into the Caribbean market. Check out the powerpoint for more details!